Spacious, clean and large rooms. Stayed in apartment #10 third floor (no elevator) 2 bedrooms 1 1/2 baths. Large rooms with queen beds in both. 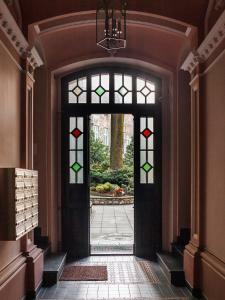 Centrally located 15 minute walk to glowsy square and 10 minutes to the Jewish area. Well worth staying in a nice and clean place. Will stay again if going to Krakow. Very clean, warm (in winter), spacious, close to center, fully equipped kitchen, huge bed. We got an early check-in. First time using an apartment Hotel and it was really great! The little extras you get at a hotel were not missed at all, with the savings meaning I was able to go with a better location and rating - which made a huge difference! Cleanliness, location, and fast check in / check out. The apartment was spacious and well equipped. 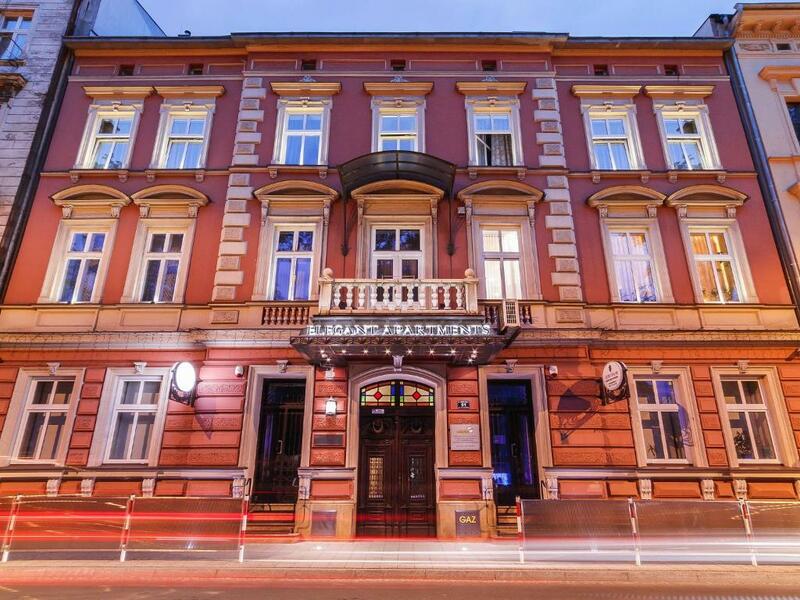 Location was great 5 minutes from old town and Jewish quarter. Parking was handy two blocks away. Awesome place, really spacious, cosy and spotless clean. We stayed in the original 19th century part of the complex, which was newly refurbished, and i am so glad we did stay there, you could literally feel the atmosphere of the old era. Loved the inner courtyard - must be fabulous sitting there during the warm summer evenings / nights - my bad we visited Kraków in January. Also, very short walking distance to the city centre - cca 15 minutes. Lots of coffee shops and restaurants around, even one 24/7 small supermarket across the street. Overall, a fantastic experience and a hidden gem you cannot miss when visiting Kraków! Everything was perfect - amazing place to stay, so nice, clean, comfortable, just wonderful! I definitely will stay again there! My family totally enjoyed stay here! +Amazing location! Fantastic stuff! The apartment was very big, comfortable, specious, clean and in a central position. Adrian was highly responsive and very helpful. I highly recommand this apartment! 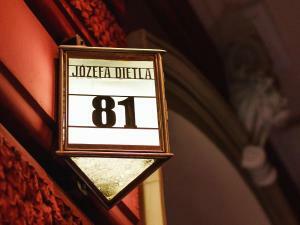 Lock in a great price for Elegant Apartments – rated 9.6 by recent guests! The apartments are housed in a 19th century city house, by the green Planty Park. Guests can enjoy satellite TV and use a work space with a desk. Each apartment features a cooking area, with kitchenware and a table to dine at. There is a fridge and a stove. The bathroom offers a shower cabin. 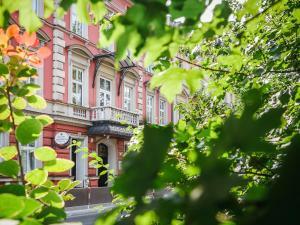 Elegant Apartments are located 2,300 feet from the Wawel Hill and 0.9 mi from the Kraków Główny Train Station. 뀐 Located in the real heart of Krakow, this property has an excellent location score of 9.7! When would you like to stay at Elegant Apartments? Air-conditioned, elegant apartment with a flat-screen TV and a kitchen with a coffee machine. There is a bathroom with shower. 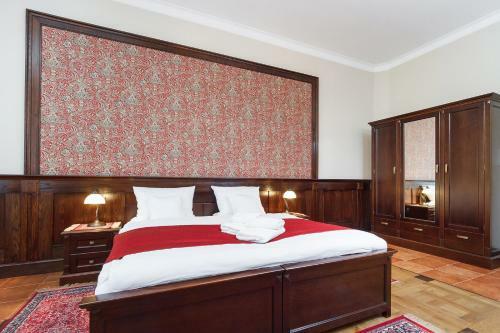 Deluxe apartment is finished to a high standard featuring quality wallpapers, heated floors and tapestries. Private parking is available at a location nearby (reservation is not needed) and costs PLN 40 per day. 2-room apartment with cable TV and a bathroom with shower. There is also a kitchen. Bright, spacious apartment with elegant furniture and air conditioning. There is a fully equipped kitchen with a coffee machine and a dishwasher. Deluxe apartment is finished to a high standard featuring quality wallpapers, heated floors and tapestries. This suite features a stove, seating area and kitchenware. The bathroom features underfloor heating. A designer studio with a kitchenette and a seating area. This apartment features a electric kettle, stovetop and private entrance. 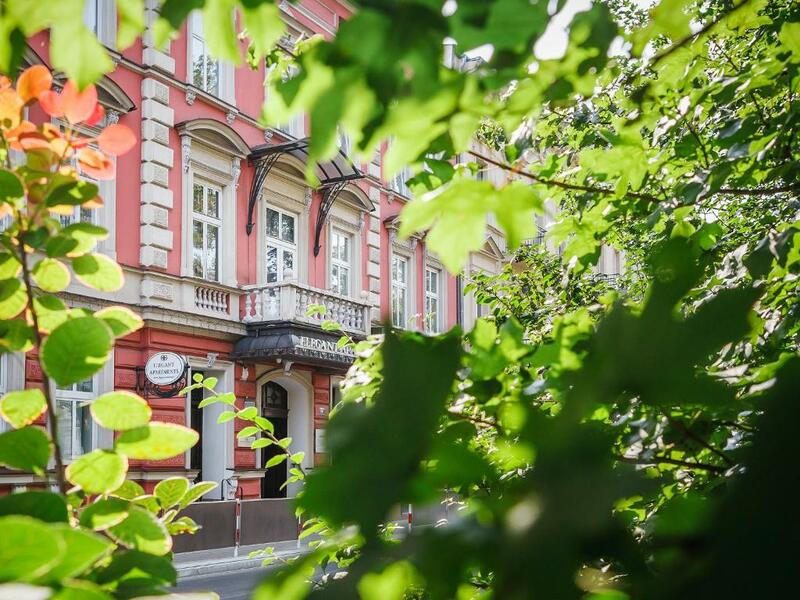 Elegant Apartments is a stylish 19th-century townhouse located in Kazimierz – the historical heart of Krakow’s city centre. Meet a place where elegance is combined with tradition. 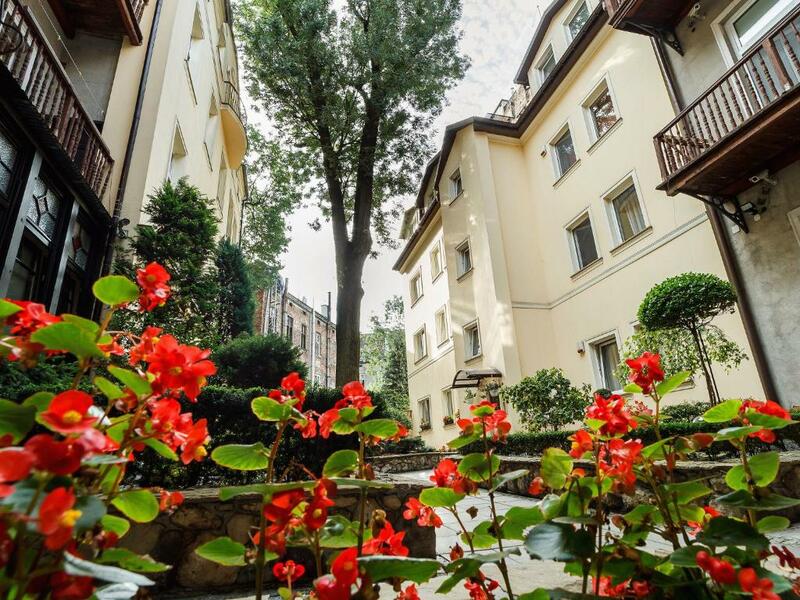 The "Elegant" residential block is a complex of independent apartments, located in the historic district of Kraków’s city centre known as Kazimierz. It is located on a boulevard with a wide green belt, which since the end of the 19th century has been called the "Planty Dietlowskie", in a two-story house built in 1884. Built in an eclectic modernist style, the house was originally owned by the Triger family. 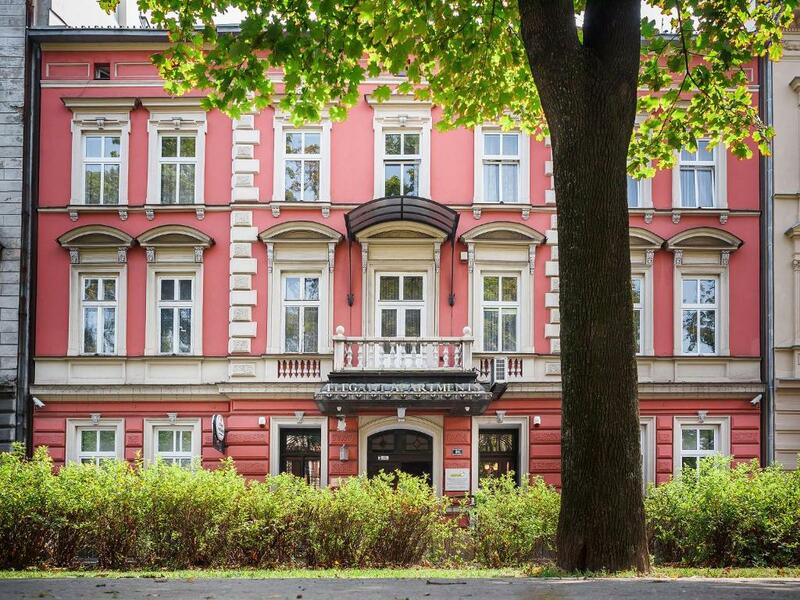 As a result of sale in 1947, it became the property of the Wylęgała family in whose hands it remains to the present day..
House Rules Elegant Apartments takes special requests – add in the next step! Elegant Apartments accepts these cards and reserves the right to temporarily hold an amount prior to arrival. Please inform Elegant Apartments of your expected arrival time in advance. You can use the Special Requests box when booking, or contact the property directly using the contact details in your confirmation. Wifi was weak but it is a beautiful old building which explains why. Bed was two singles with a gap between the mattresses. Little bit cold - only 21celsius. Radiators were cold during whole stay. Clean apartment in Kazimierz. Very good. Location and cleanliness was excellent. WiFi was not so strong, and didn't work sometimes. Parking, no complain, but I have not seen anyone there from security while I brought my car. I do not say, this was not secured, but might consider other parking place next time. Amazing apartment, well equipped. Great staff and good and safe location. Recommended place to stay. 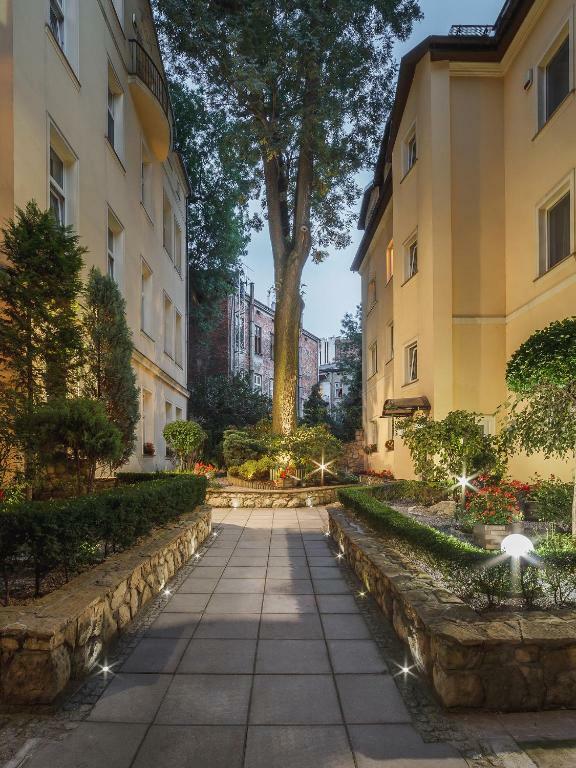 A fabulous apartment in a great area between the old town and the Jewish quarter. Really clean and comfortable and staff arranged airport transfer. Would definitively eco mend this apartment. No washing machine in the apartment. There could of been one in the complex itself though. The apartment had everything we needed. The kitchen was so well equipped, although we did not need to use it. The beds were super comfortable and the bed linen smelt amazing.... best nights sleep we had on our trip. The hosts were so helpful, told us a litttle about the history of the building etc When we first arrived I was doubting our choice, but it turned out perfect!